Various scoring systems have been proposed to quantify the disability caused by knee ligament injuries and to evaluate the results of treatment. None of these systems has found worldwide acceptance, mainly because all scoring systems attribute numerical values to factors that are not quantifiable, and then the arbitrary scores are added together for parameters not comparable with each other. For these reasons a group of knee surgeons from Europe and America met in 1987 and founded the International Knee Documentation Committee (1KDC). A common terminology and an evaluation form was created. This form is the standard form for all publications on results of treatment of knee ligament injuries. It is a concise one-page form. It includes a documentation section, a qualification section and a evaluation section. For evaluation there are four problem areas (subjective assessment, symptoms, range of motion and ligament examination). These are supplemented with four additional areas that are only documented but not included in the evaluation (compartmental findings, donor site pathology, X-ray findings and functional tests). The form can be used pre- and postoperatively and at follow-up. It has been specified that in any publication the minimum follow-up time for shortterm results should be 2 years, for medium-term results 5 years and for long-term results 10 years. The largest part of the sheet is the qualification section. It is called “qualification” section rather than “scoring” section because no scores are given. Each parameter is qualified as “normal”, “nearly normal”, “abnormal” or “severely abnormal”. This qualification is less subjective and emotional than “very good”, “good”, “fair” and “poor”. No knee and no knee function can be better than normal, and it is rather doubtful whether any knee, once operated on, can ever be “normal” again. For evaluation, the parameters of the four problem ares “subjective assessment”, “symptoms”, “range of motion” and “ligament examination”, are qualified for the group qualification. The worst qualification within the group gives the group qualification. The worst group qualification gives the final evaluation. If the knee is abnormal in any of the problem areas, it cannot be a “normal” knee. 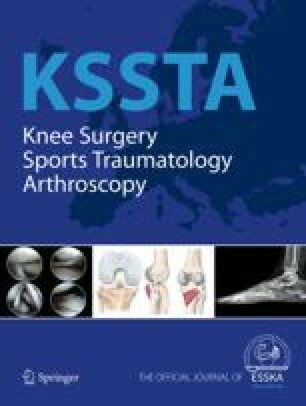 For chronic knee conditions there is also the possibility of evaluating the sum of levels of improvement or deterioration of all groups compared with the preoperative evaluation. The committee also recommends that terms describing knee ligament problems should be used according to the definitions of Noyes et al. . The use of the IKDC evaluation form will reveal less favourable results than those evaluated with other current evaluation forms, because a still existing knee problem cannot be hidden with a high numerical score that is added up from other, unrelated parameters. It is to be hoped, however, that the use of this new form will enable us to compare treatment methods in various publications with each other.